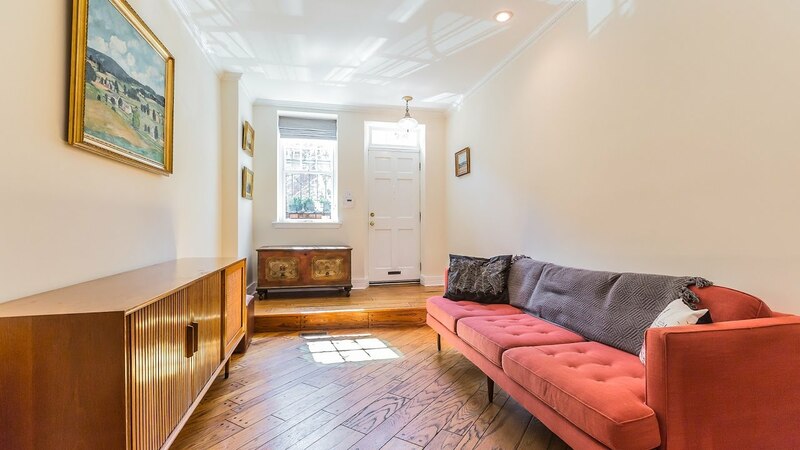 This gorgeous Queen Village home in the Meredith Catchment features 2 bedrooms, 2 bathrooms, and a private brick-paved patio! Enter into an open living/dining area featuring soaring ceilings with recessed lighting, pegged hardwood flooring, and a cozy brick fireplace. An updated kitchen offers bright modern cabinetry, subway-tile backsplash, granite countertops, a farmhouse sink, and access to a private brick-paved patio surrounded by English ivy – the perfect space for outdoor entertaining and dining al fresco! The second floor features an upstairs landing with floor-to-ceiling built-in bookshelves and the ideal space for a home office, a full bathroom with a washer, dryer, and linen closet, and a bedroom with neutral carpeting. Upstairs, the third floor boasts the master bedroom with closet and a bathroom that features a pretty pedestal sink and hex tile flooring. Located in the heart of Queen Village right off of 4th Street, you’ll be steps away from neighborhood favorites like Hungry Pigeon, Red Hook Coffee and Tea, Three Queens Yoga, Southwark, Ela, Practice Yoga, Weccacoe Playground and Tennis Courts, Mario Lanza Park and Dog Run, and Essene Market and Cafe, and more!